As part of our “Share Your Own Story” initiative for folks who have something to say but can’t seem to write an entire article, you can answer a few questions about the intersection of diversity, technology, life, and your role in connecting them. Your response will be reviewed and possibly published as a ITSPmagazine Chronicle here on DiverseIT. I am an avid traveler, a student of the world, open to new experiences and to building and sharing what I’ve learned along the way. I never imagined a career in cybersecurity but, when faced with a career choice in the Israel Defense Forces (IDF), I chose this path for all the learning opportunities I believed it would reveal (but more on that later). My curiosity about the world also led me to travel the globe for seven months and become fluent in Spanish. I love to paint and often work with acrylics and pastels. I’m also an ardent fan of bouldering — a specific kind of rock climbing without ropes. We live in age of global business with complex challenges and far-reaching implications. My recent challenge deals with global business, but on a much smaller, and more personal, scale. Just last month I was invited to speak at a technology conference. Mind you, I have presented to peers, colleagues and business associates many times before and am accustomed to often being the only woman, or one of a very select few women, in a male-dominated room. But what made this experience different was defined by language — Spanish to be specific. It was my first public speaking engagement in Spanish! And while I am self-taught fluent and now living and working in Spain to help support Guardicore customer engagements, I am still learning how certain technical concepts translate. So in addition to delivering a technical presentation to a room full of 100+ security professionals on complex issues of cloud security and zero-trust approaches, I had to do it credibly in my non-native tongue. The good news is I must have done something right, as my presentation was received and I was given positive feedback on both the content and my language capabilities! What’s more, I was able to help facilitate a relationship with a new partner in country as a result of my session, and also drew the attention of local CSO prospect. During the course of the conference, I had the opportunity to sit in on some English-speaking sessions and quickly realized the difference in the level of engagement in the room; it was clear that the audience wasn’t as comfortable with the English language and wasn’t able to “dig in” in the same way they did with Spanish-speaking presenters. I was confident in my choice before my session, but my first-hand view of those sessions affirmed my decision! As I considered the opportunity to present at this Cloud Security Alliance event, I was well aware of the cultural implications of choosing to present in Spanish versus English. Having traveled in Spanish-speaking countries for several months, I knew the key to captivating my audience and being welcomed into the fold was to speak the language. By doing so, I could demonstrate my willingness to engage not only in their culture, but in their unique business and country-specific challenges. With the support of my colleagues and a newly-minted Spanish partner and mentor, I was able to prepare, and rehearse, a session that was informative and accurate and established me as a credible source for my audience. Guardicore’s willingness to invest in me already demonstrates their commitment to diversity — and diversity of language, specifically. By enabling me to expand my talents into Spain by initiating a move for me there (a new market for the company), both Guardicore and I are able to maximize our potential — mine in broadening my skill set to include further language development, sales, marketing and country-specific business issues, and Guardicore’s in extending talent and diversity in new markets. Based in Israel, we are an emerging company with an entrepreneurial spirit and a diverse base of employees who speak 16 languages — including sign language! As the business expands its global footprint to include far-flung corners of the globe, language and cultural knowledge will be key to wider success. I do hope that my experience serves as a template for any one of our 110+ employees interested in putting their language talents and cultural diversity to work. As I mentioned previously, I like to spend my free time bouldering. My advice to women, particularly those who straddle modern industry and highly religious communities, is to overcome the fear of entering the secular world. Religious or not, it’s easy to let common barriers or fears prevent you from going for it, but don’t. Invest in yourself and prepare to “climb the rock.” When you gain skills, and present yourself well and with confidence, it can only even the playing field. Truthfully, success is more about getting past your own fears than a barrier of gender, race, age, etc. Learning to overcome your fears is a lifetime skill to use for career and personal opportunities alike. That doesn’t mean you shouldn’t express your fears though; tap into your “mattress” and share the load with close friends, family and mentors who can help you address your fear of falling. With a background in art and painting, including exhibitions in Israel and Japan when I was younger, I never imagined a career in cybersecurity. 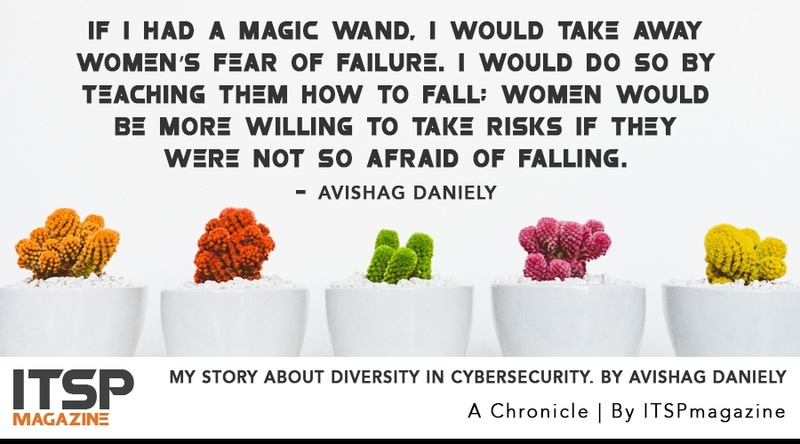 However, when faced with a choice between ground or cybersecurity operations as part of my required two year service with the Israel Defense Forces (IDF), I opted for cybersecurity after a heartfelt conversation with my father about choosing a path that would continue to reveal learning opportunities. Taking an initial interest in technology and foreign relations, I grew to find roles within IDF that would leverage my creative abilities, including the development and management of campaigns to identify heads of commercial and state-sponsored crime gangs, while embracing a willingness to explore the unknown. These same qualities eventually took me to multiple cybersecurity analyst and research positions with CyberArk, Veronis, and Guardicore, where I am currently Director of Product Management. As the world continues to move to “digital everything,” securing the things that matter most to people and organizations will only become more critical to everyday life — how we work, play and get things done. I feel privileged to work in an industry that protects those things for everyone. What I value most about my career and this industry is the opportunity to keep learning and gaining new experiences; technology will only continue to accelerate and expand so I expect a lifetime of learning. I am particularly lucky to get to do so within my work environment and recognize that not everyone is fortunate to have the same kind of professional support system we do. The combination of colleagues, friends, challenging work and an opportunity to accelerate my career in an engaging daily environment keeps me coming back for more! I have always believed in choosing the right person for the job. And I’ve seen many women who are right for the job walk away because of a fear of engaging at the next level. If I started my own company, it would be by, with, and for women, not because I believe they are better than men, but because I believe we still have work to do in terms of creating an even playing field. Women are often fearful for whatever reason; I’d like to make the leap easier for them with encouragement and support. This motivates me. Don’t be afraid to take the leap and fall. Just remember to bring your mattress! Do you have a story to tell? Click the button below to answer a few questions about the intersection of diversity, technology, life, and your role in connecting them together. Avishag is Director of Product Management at Guardicore. Newer PostCyber Insurance For Individuals Is Coming. Will It Make People More Or Less Secure?